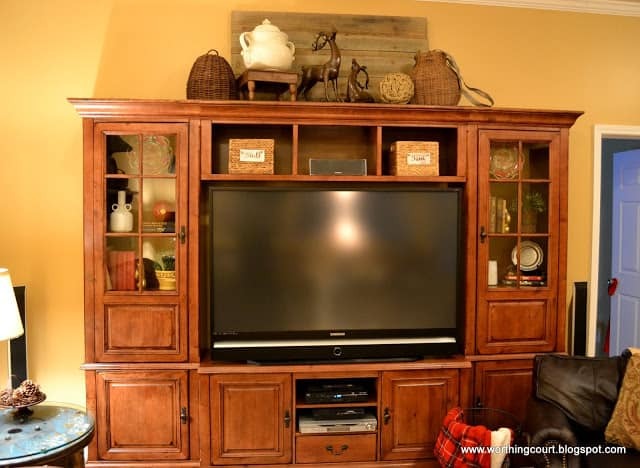 A couple of the items that we brought with us to our new house are the entertainment center and the tv that it houses. It was formerly located in the basement at our previous home. 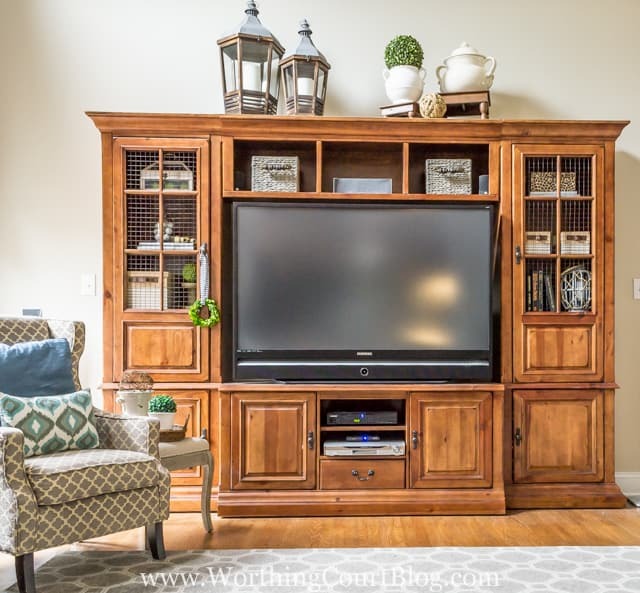 I didn’t especially want the huge tv in our family room, but you know how a lot of men are when it comes to televisions – the bigger the better. Ahem. Pookie loves his big screen tv and I just couldn’t quash his excitement, so I decided to make it work and I actually love it too! This is how the entertainment center looked for the past several months. It was pretty much filled with some stuff that I just threw in there as I was unpacking boxes after we moved in. Not all that bad, but it wasn’t quite the look that I had in mind. Plus, there was a lot of reflection off of the glass door inserts that prevented you from being able to see everything that was inside. In this photo, you can especially see it in the glass on the left side. I knew that the solution was to replace the glass with a wire mesh insert, but have you priced those puppies? Gulp – they’re expensive! Enter a very affordable roll of cage wire from Tractor Supply Co. If you don’t have a TSC in your area, click HERE to order it online. And this is how the entertainment center looks today! At first glance, you may not think that it looks all that different, but let’s look a little closer. I’m so, so happy with how the cage wire looks on my doors and now I can actually see what’s on those shelves! You’ve probably seen a lot of people using chicken wire for this same sort of project, but it wouldn’t work for me. I needed a product that was thick enough to retain its shape without being stapled all the way around the edges to hold it taut. Stapling into my wood doors just wasn’t going to cut it. I simply cut the cage wire to the exact size that I wanted (with a pair of wire snips) and placed it into the door frame using the same clips that had been holding the pieces of glass in place. I’m not sure why it looks wavy in this photo, but it isn’t. 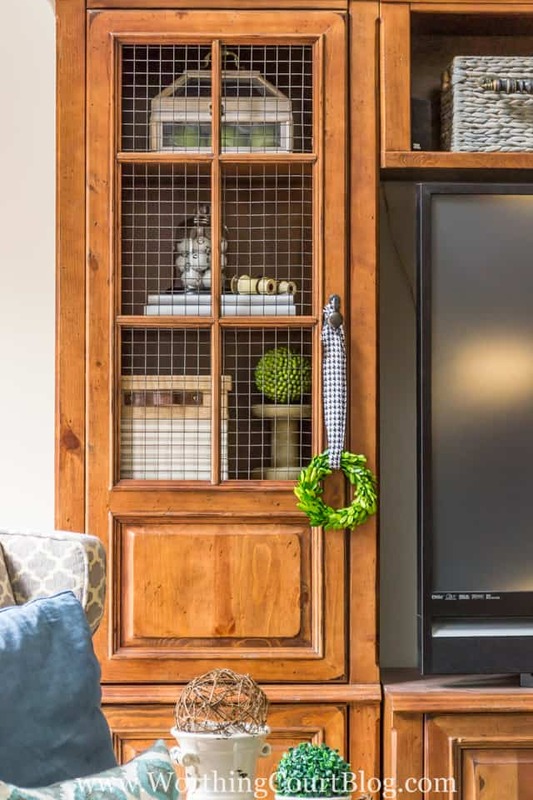 The cage wire is silver, but to make it blend with the hardware that was already on the entertainment center and to get rid of the shine, I gave it a couple of coats of spray paint in Oil Rubbed Bronze. The left side of the unit contains a mini terrarium filled with faux green apples, a glass cloche filled with enamel number orbs from Pier 1, my grandmother’s ivory opera glasses, a fabric covered box and a pedestal and greenery orb. 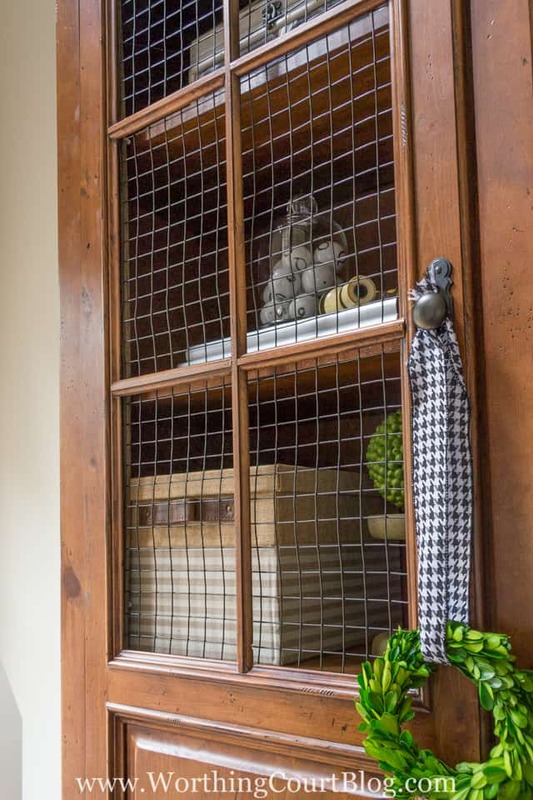 A piece of black and white houndstooth ribbon sets off the boxwood wreath that is hanging from the knob. 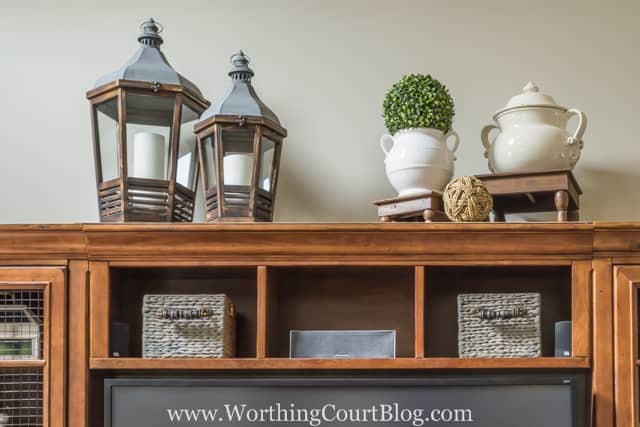 The right side cabinet contains a leaf and vine covered wooden box from the clearance section at Pottery Barn, two more fabric covered boxes, a few books and a weathered wood lantern. The wooden box in this cabinet and the glass cloche on the other side are resting on some of my old coffee table books that I simply wrapped white wrapping paper around. I took the jackets off of the books and traced around them to make covers that perfectly fit each book. Not only do I love the fabric on the boxes, I also love the added touch of a leather handle on each end of the box. They came from Target and are very affordable. I couldn’t find them online, but my local Target stores all had several of the boxes in stock at the store. I still like the vignette that I put together for the top, so I left it as it was. I did ramp up the look of the straw baskets a little bit though. First, I gave them a wash of gray paint and then added handles that I found at Hobby Lobby. Love, love, love them now! So that’s one more project checked off of my to-do list for the family room! I hope that I’ll have curtains and maybe shades hung in the next week or two. 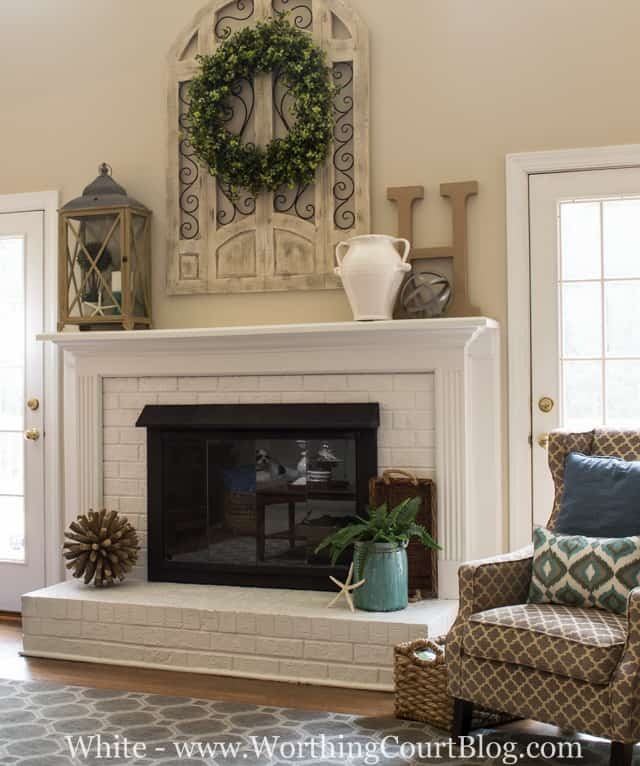 Want to see another makeover that we did in our family room? Just for fun, here’s how the same entertainment center looked in the basement of our last house. Click HERE to see a full tour of the room and to see all of the projects that I did. Sharing at Home Stories A To Z, Savvy Southern Style and THESE other great parties. I love the wire addition! 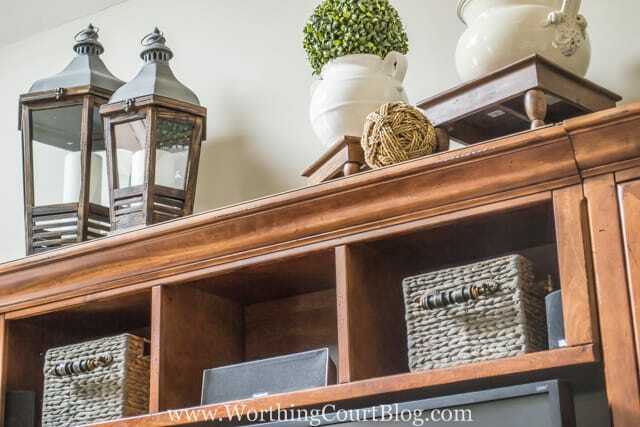 Please share how you attached the Hobby Lobby handles to the baskets. I have never thought about doing that. Hi April. It was really easy to attach them – I just pushed the screws that are already attached to the handles through the wicker and added a rather large washer and wing nut to the backside to hold them in place. Glad you like the wire! 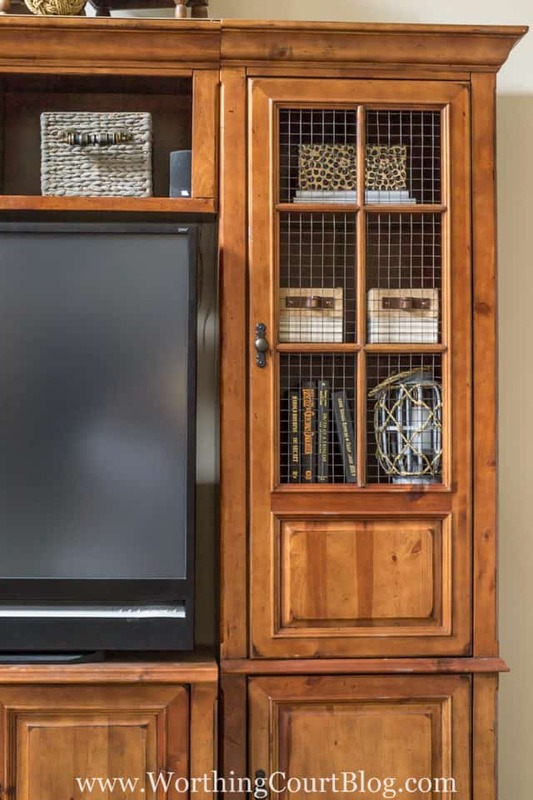 Great idea…I have also seen mesh from the BBQ grates used….Pretty entertainment center Suzy…lots of beautiful details on the shelves. I’ve seen the grill grates used too, Shirley, but the holes were a little smaller than what I wanted for this project. Glad you like the entertainment center! I love the simple change you made. It gives it more of a farmhouse style and you made it unique. So glad you like it, Mary! A little more farmhouse is exactly the look that I was going for. I love how this turned out! 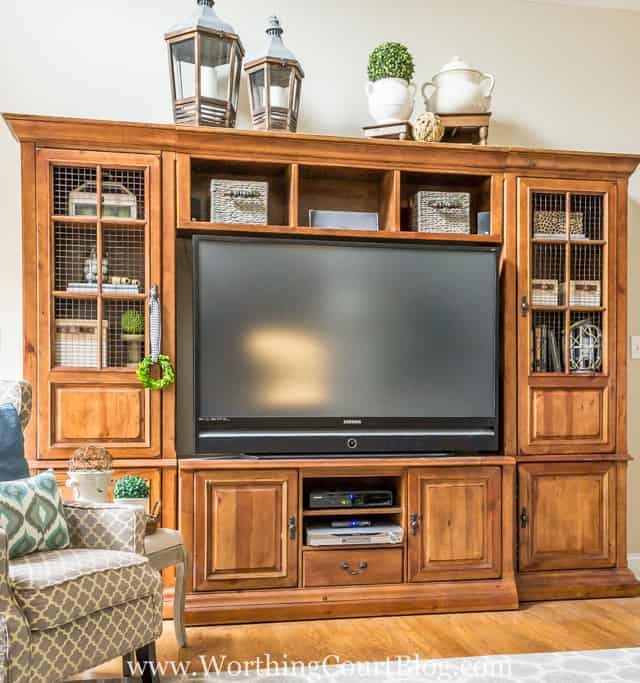 I have a similar style entertainment center that I have been wanting to change the look of. 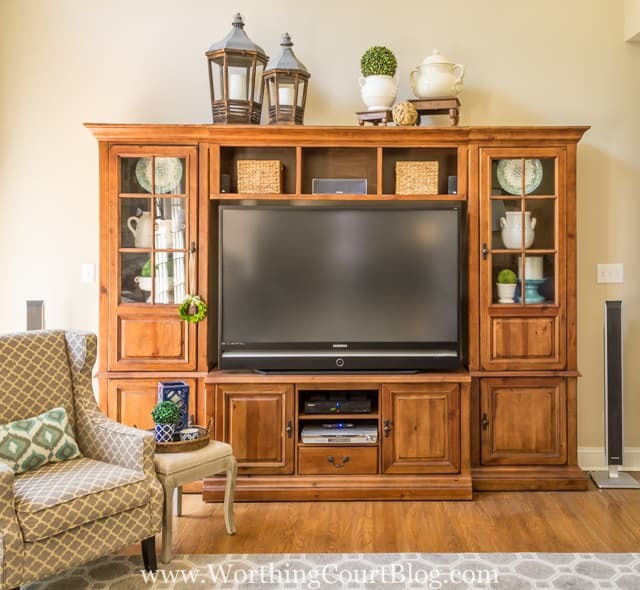 Although my husband loves many of the painted prices of furniture I have done in the past, he wasn’t on board with the idea of painting our very large entertainment center. I can’t wait to show him this idea…a more subtle change with more farmhouse charm and no paint. Thanks for sharing! Hi Dorene. I gave a lot of thought to painting ours, but I knew my hubby would prefer to leave it alone too. Plus, I didn’t want to tackle such a large paint job. lol Anyway – I’m so glad you were able to get some inspiration from what I did! Just visiting ,but i love what you did to your cabinet ,it really gave it farmhouse look. Such a simple change but it really made a huge difference! Your project turned out great Suzy. It looks wonderful! I wonder if the cade wire is easier toward with than chicken wire? I have attempted chicken wire and gave up. I love how something simple as changing the glass could make such an impact and you can always put back the glass. Easier than painting a beautiful wood finish. Never would have thought of this technique. Good suggestion! I’m new to your blog and I absolutely love it! This is my style! Thanks! Just love all of your decorating ideas! Keep them coming! !